I'm (very) new to PowerTAC, and I'm developing my first agent. 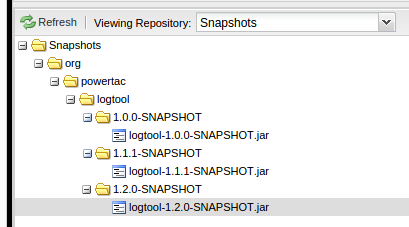 For example, when I want to compile the logtool-examples in maven, it can't find org.powertac:logtool:jar:1.1.0-SNAPSHOT . I looked at https://oss.sonatype.org/content/repositories/snapshots/, and it's really not there, there is only org.powertac:logtool:jar:1.0.0-SNAPSHOT. However, this one has dependency on org.powertac:server-master:pom:1.0.0-SNAPSHOT, which is not on the repository any more. Am I doing something wrong? Is this tool still supported? That's my fault - I've done a couple releases without including the logtool. I have opened issue #796 for this; I'll try to get it fixed in the next hour or so. I have bumped the version ID for the logtool module to 1.1.0, to match the 2014 release. It should be fine for any log generated since early 2014, and probably for older ones. It is pushed and deployed. You will need to pull down the latest powertac-tools version from github to get the version of logtool-examples that depends on logtool-1.1.0. Looking in the repository (https://oss.sonatype.org/content/repositories/snapshots/org/powertac/logtool/), it really looks like the only version available is 1.0.0. I tried to compile to logtool .jar locally and install it in maven - however, I didn't find a way to do it correctly yet. (Update: managed to installed the .jar manually). Update: I manage to run the tool by compiling the logtool to .jar locally and then installing it to logtool-examples. Is this how it's supposed to work? OK, it turns out that the way I have the logtool material packaged on github does not mesh well with the maven release processor. I'm not sure it's worth trying to fix it in the short term, so I have deployed two new snapshot versions. One is 1.1.1-SNAPSHOT which is compatible with the 2014 game data, and the other is 1.2.0-SNAPSHOT which will be updated if necessary to work with the 2015 game data (there is talk of a couple additional properties in the Rate structure, for example). At this point in time, there is no difference between them. If you pull down the latest powertac-tools, you will get the 1.2.0-SNAPSHOT, which is on the development trunk - the master branch in github. If you want stability to analyze the 2014 game data, you should clone powertac-tools and then switch to the "maintenance-1.1.1" branch. The logtool core for that is deployed, and if there are maintenance issues on that version we will keep it on that branch. It's equivalent to a release branch for those who know something about release process and configuration management. Here's a screenshot of the current content of the Sonatype snapshot repo for the logtool. I hope this solves the problem. As always, don't hesitate to ask if you run into difficulty or have suggestions about how we could improve. Works perfectly! Thanks a lot for such a quick help!